Approximately 12,000 offenders are released into the community annually (Virginia Department of Corrections, 2018). This does NOT include the number that are released from local jails; in Richmond alone, the jail releases nearly 10,000 people a year. Upon release, offenders face a variety of obstacles—finding employment, housing, transportation, mental health services, and treatment for substance use disorder, to name only a few —that make it difficult to reintegrate into the community and thrive. REAL LIFE was established in response to overcome these barriers. More than that, REAL Life’s objective broadened past those formerly incarcerated to include services for those who experience homelessness, substance abuse, or any other adverse circumstances. Simply stated, they support a variety of demographics with a range of adversities to improve life on many levels—for the individual, family, and community. 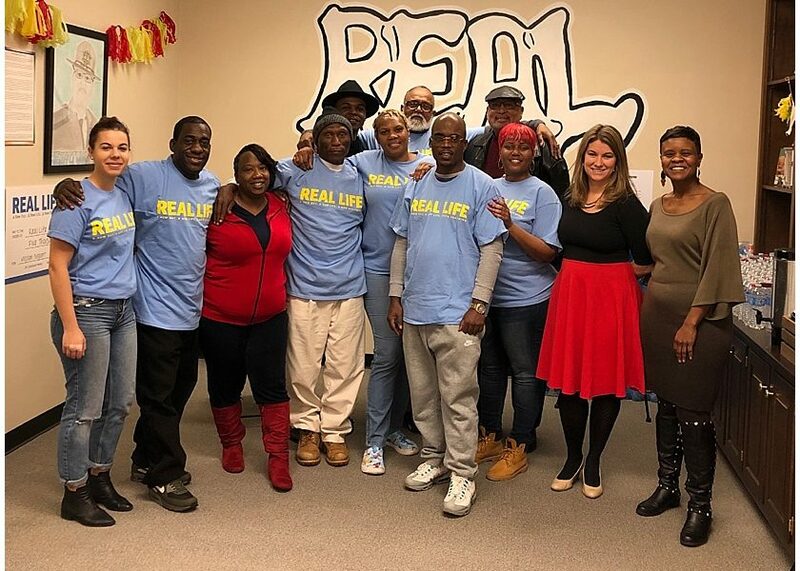 From the time the REAL LIFE Community Center opened in December 2017 to November 2018, information was collected and quantified regarding the population served and the outcomes of the program. The purpose of sharing this information is to humanize the population that REAL LIFE assists, while educating the community on the services provided that support the specific interests of REAL LIFE’s participants. In the period of 11 months, REAL LIFE served 411 (n) individuals—each deciding to open the door into REAL Life to receive help. They each have a name and a story—don’t lose that in the numbers and percentages. The population is largely African American (72%) and Caucasian (25%). Approximately 67% were male and 33% female. REAL LIFE offers motherhood and fatherhood classes, as well as gender-specific trauma support groups. The Expectant Mother Program is another service that goes beyond typical case management to provide holistic care in support of new mothers and mothers-to-be. In the period this data was collected, 73 women were served (this is a part of the 411 previously listed). Educational levels vary greatly from receiving a high school diploma (19%), GED (30%), or achieving some college or vocational training (1%). REAL LIFE meets clients where they are and offer classes and opportunities to further education. REAL LIFE also partners with Richmond Public Schools to offer GED preparation and testing to clients. REAL LIFE also works with clients to identify needs and create a plan accordingly. Those who are looking for employment may receive guidance in resume building, attend financial literacy courses, and utilize the computer lab during open hours. Another opportunity, available twice a year, is Jobs for Life, which is an 8-week-long program that focuses on job preparation through a variety of methods. Housing is a common need of clients. Recognizing the value of a stable environment, REAL LIFE assists clients with skills and resources necessary to find suitable residence. The REAL House is just one option for this need. It is a short-term, sober-living option for men to learn and apply skills towards independent living. About 71% of clients have previously been diagnosed or are currently diagnosed with a mental illness—this presents a great need. Various classes are available to teach life skills, self-determination, and pro-social activities to support mental well-being. Case managers and peer support specialists can suggest further resources for mental health and counseling services. Substance use disorder is a risk factor seen in 53% of participants at REAL LIFE. Sustaining sobriety, the main pillar of service at REAL Life, means breaking the cycles of addiction and addictive lifestyles towards a thriving life. Clients may attend Drug Addiction and Recovery meetings and Recovery Life Skills classes to understand their addiction and learn healthy coping mechanisms for recovery. Case managers will work closely with clients to support the recovery process. Of the population served (n=411), 2% recidivated, 14% relapsed, 24% found employment, and 12% acquired housing from homelessness. To understand the significance of these statistics and outcomes, you have to consider that every number is a human—that is what unites us. Ultimately, it is REAL LIFE’s vision to encourage client growth through personal barriers towards a prosperous and thriving life. Real life can happen to any of us. Instead of noting the differences to change the individual, realizing the similarities could change the community.